Every year, 300,000 children are born with sickle-cell disease, primarily in Africa and India. It is a genetic disorder that causes some blood cells to become abnormally shaped. The result is that those who suffer from it have a shorter lifespan. The disease can be managed if it is diagnosed early, which means it rarely kills in rich countries, such as the US. But in sub-Saharan Africa, where it is most prevalent, most children with the disease still die before their fifth birthday. Now a diagnostic test that costs less than ₹30, takes only 10 minutes to run and uses simple, high-school physics could help save many lives. New York-style pizza is great, but it has a holding problem. There is a solution, and you probably know what it is: just fold the pizza into a U-shape. Turns out the maths behind why such folds beat gravity is fascinating and has many interesting applications. Here, in his typical clarity, is Aatish Bhatia explaining it all with pictures and videos. Almost a hundred years ago, on a ship back from London, Chandrashekhar Venkata Raman asked the question why the sea is blue. Having heard the answer that it is a reflection of the sky, he remained dissatisfied, for the blue in the oceans seemed too fantastic to be a mere reflection. His quest won him a Nobel Prize and gave the world the Raman effect. Now scientists in India are finding new applications that use the Raman effect, from detecting bombs to finding new drugs. + The author, Priyanka Pulla, is a Bengaluru-based freelance journalist and Takshashila Institute scholar. Signed in 1960, this treaty has survived the stress and strain that come with Indo-Pak relations. And yet, it is time that the treaty gets an overhaul. With floods in the waters that feed the Indus river having already killed more than 200 people, an update could help spur the developments needed to help prevent and deal with such natural disasters. 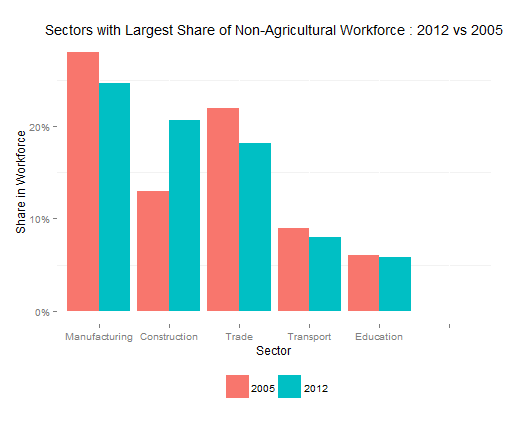 The year 2012 was the first year when less than 50% of India’s workforce was employed by the agricultural sector. In the recent decades that shift has been rapid, but what else are these former agricultural workers now doing? An analysis by Datastories.in reveals that a lot of them have been absorbed by the construction sector. The trouble is — you should click here to see more charts — most of these constructions workers become casual labourers with no form of social net. This must change to improve the lives of those at the bottom.